Custom print featuring the map of any two countries or states, with the hearts placed in the location of your choice and personalized with your names. It is a great reminder of your long distance love story. 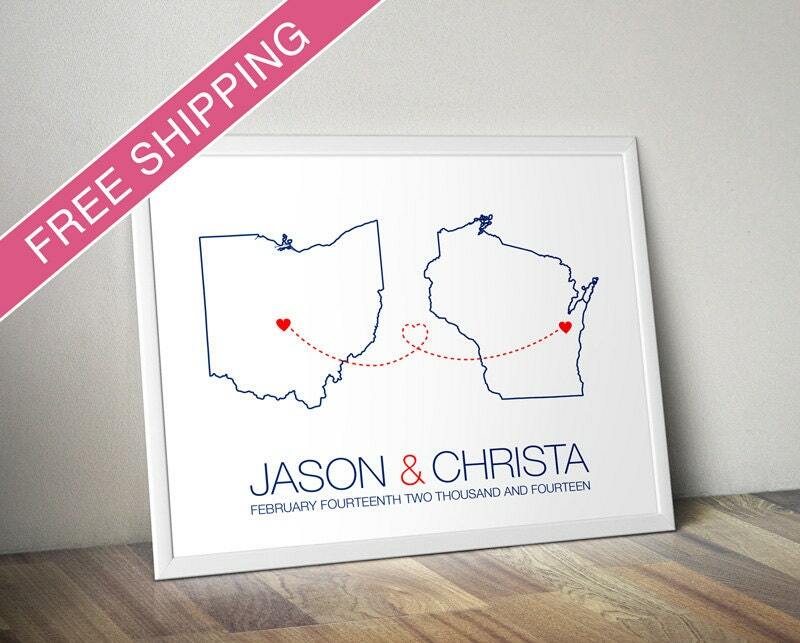 This artwork makes a beautiful wedding, anniversary, or engagement gift. It can also be used as a guest book alternative, allowing guests to sign the print instead of a book, and afterwards, you can hang it in your home as a keepsake reminder of your special day. The design is available on paper, canvas, or digital. Framed Prints and Canvas Prints are only available in the US. All of the ordering information is below. • If you would like a custom color, just send me a link or a picture for sample. • Any other text you would like to add or any other important information. • If you are ordering a Framed Print, please let me know if you would like a Black or White frame. 2. Within 48 hours, I will email you a proof of your design for approval. You can verify the information and make any changes necessary. Prints are not produced until it's been approved by you. 3. Once approved: Digital Files are emailed within 1 business day. Prints ship out within 3-4 business days. Framed Prints and Canvas Prints ship out in approximately 7-10 days. • Expedited shipping is available during checkout. Expedited shipping does not change the production time for your order to be made, only the shipping time. Paper Prints are professionally printed on premier photo paper with vibrant colors and archival up to 100 years. Framed Prints use a modern 1” wood frame, available in Black or White. Each order is professionally framed and ready to be displayed. Framed Prints are only available in the US. Canvas Prints are printed on high-quality, heavyweight canvas to give them a real artistic feel. Canvas Prints are stretched onto a sturdy wood frame so they arrive ready to hang. Canvas Prints are only available in the US. Digital Files are sent as high resolution JPG files via email (no physical product will be shipped). If you are using the print as a guest book alternative, please consider the following recommendations. People tend to write bigger and more when you give them more room. These are the suggested sizes. For Paper Prints, I recommend the ZIG Photo Signature Pen. The pen is specially designed to write on photo prints. They are available on Amazon and may be available in your local photo or stationery store. If you are in a rush and these pens are not available, a Sharpie Ultra Fine will work as well but they may not be as archival. However, Sharpies can be found in any stationery store. For Canvas Prints, I recommend the Sharpie Water-Based Paint Marker. The paint markers do have to be prepared beforehand, shaken and the tip held down for a second for the paint to start flowing. If this is too much trouble, a Sharpie Fine Point marker will work as well. You can provide your guests with assorted colors of pens if you want to have a more colorful end result. Sharpies also come in gold and silver. If your are purchasing a framed print for signing, you can remove the plexiglass cover and set it aside and place the print back inside the frame. This will make your print look elegant and give it support. Then after the wedding, just place the plexiglass back in and you're ready to display. Please note that each framed print order is professionally framed and finished, to remove the backing, you will need a staple remover, hammer, or pliers. Any map in the world is available. Just let me know which map you want and I'll be glad to create it for you! If you have any additional questions, please feel free to send me a message!. © 2013 Miller Sye. Artist retains all reproduction and copyrights. Amazing custom order that arrived with plenty of time to spare! High quality print and perfect guest book for a destination wedding. This was a gift for my daughter's friend. After delivery, the gift was taken by an unknown shady thief, so I had to reorder. The shop owner was great! I was able to submit the reorder and had no problems with delivery for the next shipment. She sent me a discount code for the reorder. The recipient couldn't be happier with her unique, one-of-a-kind, personal gift. It was perfect! I highly recommend this shop! Beautiful wedding print on very nice quality paper. Cant wait to give it as a gift....I now want one for myself! This is perfect!! We are using this as our "guest book" for our wedding in Dominican- guests will sign the frame. Looks beautiful in a thick white frame! I accept payment with all major credit cards and PayPal. Please contact me if you have any problems with your purchase and I'll be glad to help you resolve it. If you are ordering a custom print, you will receive a proof for your approval within 48 hours of order placement (please check your email). Prints ship out within 3-4 business days. Framed Prints and Canvas Prints ship out in approximately 7-10 days. Please feel free to contact me with any questions, etc., about your order. DOMESTIC SHIPPING POLICY: Domestic (USA) orders are shipped via USPS First Class Mail or UPS Ground unless the package is too large, in which case, I will use Priority Mail. Domestic First Class Mail usually arrives in 3-5 business days. Expedited shipping is available during checkout. Expedited shipping does not change the production time for your order to be made, only the shipping time. INTERNATIONAL SHIPPING POLICY: International customers are responsible for any and all taxes, fees and tariffs associated with Customs. These fees and tariffs are not included in either the purchase and/or shipping costs and I have no control over them. Full retail value of items is listed on customs forms. International packages usually arrives in 6-12 business days, depending on your location. I try to make the color chart as exact as possible, but due to variations in computer monitors, I can not guarantee the color you see on your screen will be a perfect match.